The answer to this puzzle should answer the question: what is required to solve this puzzle? 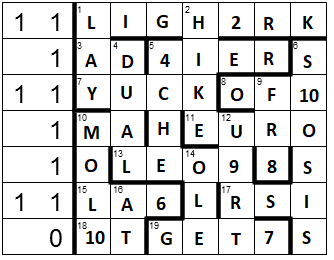 The twist is that certain entries need to have a few letters filled into a single square, like LIGH(TWO)RK and (FOUR)IER. These happen to form numbers. 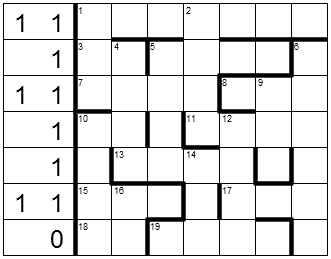 The numbers in the grid form givens for a Kuromasu puzzle. 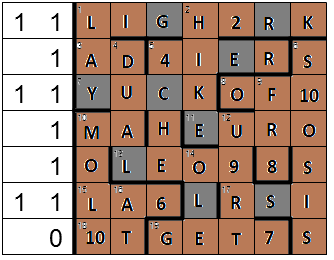 The clues on the right are clues to the number of shaded cells in that row, a-la Picross/Nonograms. These clues can be used together to find all the shaded cells in the grid. The puzzle itself isn't too hard, but if anyone wants a walkthough, let me know. The shaded spaces show us what we needed to solve this puzzle, GREY CELLS. Not the answer you're looking for? Browse other questions tagged grid-deduction crosswords or ask your own question.